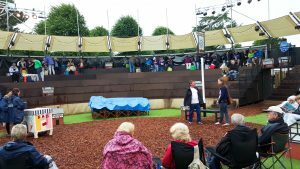 It’s that time of year again, so another trip to Chester to see Richard, Caroline, and Joseph and some open air Shakespeare. Thankfully the journey to Chester was uneventful, although for some reason the train company hadn’t booked us in adjacent seats—luckily we were able to swap to sit together. The plan on reaching Chester had been to do our usual trick of heading into the Town Crier for some lunch but for some reason it was exceptionally busy. The Queen Hotel over the road was hosting a wedding and didn’t look like offering refuge so we set off down the road. Fortunately that brought us to the canal where we found the Old Harkers Arms, a lovely pub with decent beer and food. My steak sandwich was just the thing while Heather’s smoke haddock kedgeree was nice too. Refreshed we set off back up the road to the guest house. When we arrived we found that a new management was in place (no ginger cake!) and it was actually in the process of being sold! The rooms and service were still good though so can’t complain. We didn’t have much time to reflect on such things anyway as we quickly settled and changed to head out for the evening. Calling in to Tesco for supplies on the way (one day we’ll be organised enough to arrange a proper picnic in a foreign town) we headed for Grosvener Park. 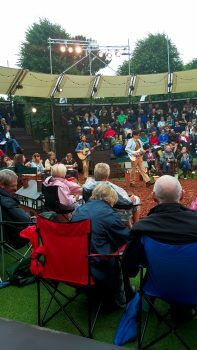 There the open air theatre was once again set up. We tucked into the picnic and waited for things to begin. The bit of Shakespeare we’d chosen this year was one I’d never read or seen before, The Merry Wives of Windsor. Interestingly the company had reinterpreted its setting to a 1970s period, while retaining the original dialogue. This worked fairly well as the play rushed through its romp but I think I would have preferred to have been a little more familiar with it and seen it done traditionally before watching this version. Still, the only thing which really put a damper on things was the absolute torrential rain falling by the end. Soaked through, we made our way merrily back to bed. The next morning saw me join Heather for breakfast. My having breakfast is such an unusual event it’s certainly worthy of note—I still don’t see what the fuss is about though. 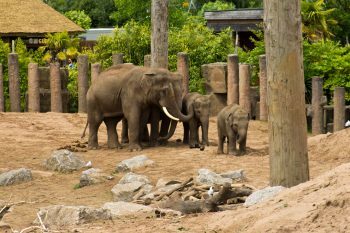 We were up and ready nice and early because we were being picked up by Heather’s brother Richard, who, along with his wife Caroline and little Joseph (now two), took us to the zoo* I’m not a huge fan of zoos, and still aren’t, but I was pretty out voted. After we’d struggled through buying a ticket (Richard and family have season passes) we got into the sunny zoo and started big, with the elephants. They are majestic creatures, which makes it a bit of a shame they’re world is easily taken within a glance. Still, the family didn’t seem unhappy. Leaving them behind we caught a look at a donkey like creature called an onager before stopping so Joe could chase some ducks. 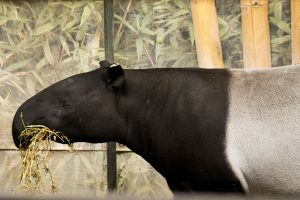 There were more strange creatures, including the Newcastle supporting tapir before we reached the familiar territory of giraffes. 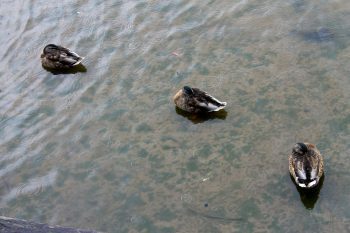 There was a whole group of them, including a young, with their strange spindly legs which seem incapable of supporting such a body and reaching neck. Next up came the tropical aviary, first passing some old tortoises. Inside the aviary small, brightly coloured birds darted this way and that in flashes of colour. We wound our way through and upwards, larger birds seeming to gather, stiller, towards the heights. 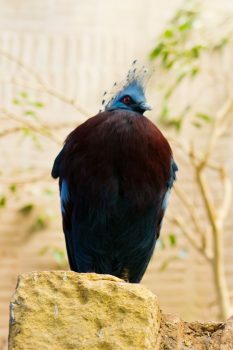 Back at the exit we found a big blue crowned pigeon watching over everything like a king. After a relaxed lunch we continued, seeing an even more relaxed sloth and glimpsing a jaguar before the orangutans (and lar gibbons). They were difficult to find at times, large swaths of grass lying empty of orangs. There were one or two to spot though, mainly indoors, including one who decided to climb up high to have a pee. We continued around the zoo, passing the bright, eye catching flamingoes and the duller but cuter penguins. Both the tiger and the lion were annoying difficult to see, the tiger hiding high in leaves with her cubs and the lion simply lazily lying the wrong way round. There followed another pit stop, so Joe could have some chocolate and the adults could have a pause in the walking. We were soon on our way though and next up was the darkness of the bat house. As neither Richard or Caroline are overly found of bats Heather and I took Joe around. It was tricky to see anything even once eyes adjusted but still good fun, even if one had to be alert not to lose Joe in the dark! 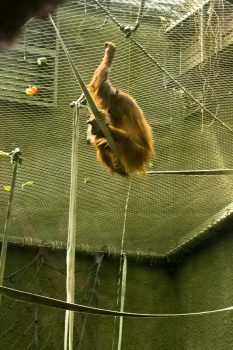 There were more animals to see, including the lazy capybaras and another, duller tapir. 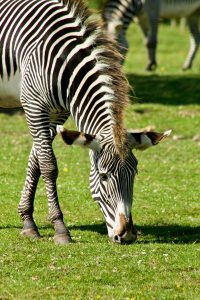 Then there were one of my favourites, the stripy horse of the zebra, their patterning dazzling in the bright sunshine. They also had the advantage of being easy to see. Not as easy to see were the deer like creatures I’m told were nyala, which shyly kept to the shade of there indoor hut. Another stop by an aardvark followed, at a little picnic area beside the roan antelope. 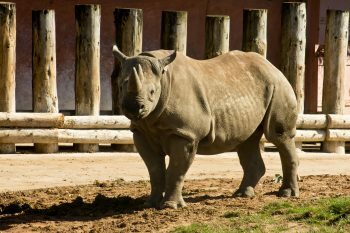 Wandering past the rather dull African painted dogs we came to the looming and huge rhino, who helpfully came ponderously outside to give us a better look. There was still time to fit in the cute as ever meerkats, catching them doing the meerkat “thing”, before heading out, via of course the quite large gift shop where we were very restrained. After the excitement of the zoo we headed for an early dinner at the Oaklands Hotel (a grander name than the pub it is really) before heading to spend the evening at Richard and Caroline’s. There we learned that Charlie is still in Casualty before heading away to bed. On the Sunday it rained but we weren’t going to let that dampen us too much (particularly following the soaking we’d had watching Shakespeare), so into town we went. We didn’t really have much of a plan and ended up aimlessly wandering a bit. The Victoria was unfortunately closed but the fudge shop wasn’t. We ended up down towards the river (having headed in a direction which turned out to not be the one we thought), and stumbled across a pub Richard had mentioned the night before in the The Architect. To be honest it’s one of those places which has forgotten it’s a pub and really wants to be a restaurant. The chairs were comfy but the constant pressure that we should really be eating their over priced food was not. We left and followed the walls around past the racecourse to walk along the river bank. Remembering another pub Richard had recommended we headed for the Boathouse. It was nice enough (good glasses shape) if a little full but it would have been much nicer to be there with sunshine outside rather than constant rain. We walked back up into town through that constant rain and then completed our wandering circle by finding the Bear and Billet, a favourite of last time. After a couple of cozy drinks though we headed back to the guest house with the plan to visit our favourite Chester Indian restaurant. Hoole Indian didn’t disappoint with my khofta bhuna or Heather’s dish. They’ve still got the cutlery I want to steal as well. Monday’s better weather saw us reluctantly leave Chester behind. As last time we dragged our bags down towards the station, finding that the hotels there have gone into competition for luggage storage, which at least drops the price. Bags deposited it was off to go around the shops we’d been saving up. First was a city centre call at the sweet shop (we were very restrained) and the the the cheese shop for Heather. 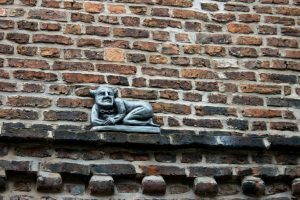 Luckily that’s just across the road from one of our favourite Chester pubs, so paid a little visit to the Pied Bull (after admiring the funny demon thing on its wall first). 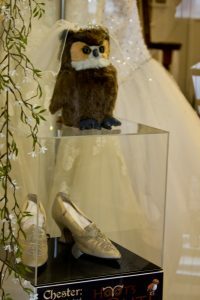 As we wandered around afterwards Heather discovered Hoot’s Route and so we pleasantly spent the rest of the afternoon wandering from shop to shop so Heather could find the cuddly owls. And then it was home again, arranging seats to be together on the train again (thanks Virgin). The Euston Flyer provided its traditional last bit of holiday. Until next time! The post The Merry Animals of Chester was first published on Saturday 8th August 2015 at 9:54 am .